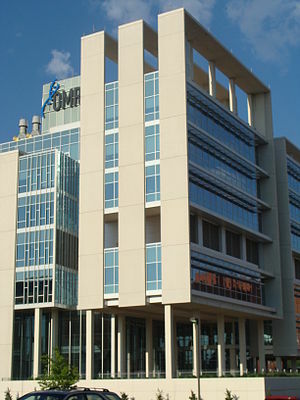 The Oklahoma Medical Research Foundation is a major research institution, but not a household word. Let me explain its importance in my life. Everything that happens to a writer passes into his memory, sinks to the bottom, and grinds around there, knocking sparks off every other experience. Years later, it emerges, transmogrified, as stories or parts of stories. My soul as a writer and as a human being was forged on a small farm, working essentially full time in addition to going to school. I was an only child. School and home were kept strictly separated. Except for one treasured cousin, none of my school friends ever entered my house. I was a very smart child in a very small place. I worked hard, got strong, and loved the outdoor life, but my mind lived in other worlds, brought to me by books of science fiction. I decided to become a scientist. In that pursuit, I was torn between space science and ecology. When I was a high school junior, I put those two together (yesterday’s post). That same year, among the many standardized tests we took, was the test to become a Fleming Fellow. There was also an application to be filled out in which I was to explain my aspirations and offer any personal projects to prove my capacity. I wrote up my ecosystem in space project. I was notified that I was a finalist, and scheduled for an interview in Oklahoma City. At that time, I knew almost nothing about the fellowship or the OMRF. Incorporated in 1946, the Oklahoma Medical Research Foundation was dedicated in 1949 by Nobel Laureate Sir Alexander Fleming. In 1957, OMRF started a summer program for students, which was quickly named the Fleming Scholar Program. It has evolved over the years, but in that era, from four to seven Oklahoma High School juniors were recruited, and spent eight weeks at the OMRF the following summer. I said to the panel that I intended to pursue a Ph.D. The whole panel tried to convince me that I should be getting an M.D. instead. I held my ground, and when the interview was over, one of the panelists admitted that most of them had Ph.D.s, not M.D.s. Fortunately, self-confidence – or arrogance, if you prefer – is something I have never lacked. I received a Fellowship. I’ll tell you about it tomorrow. This entry was posted in A Writing Life and tagged ecology, memoir, teaching, writing on March 8, 2017 by sydlogsdon.